Poached eggs are perfect paired with buttered brown bread toast to make a comforting breakfast on any day of the week. This is the simple way to transform the humble egg into a luxurious treat. It's oil free food and their taste is creamy in texture. It's easy to prepare. This is the healthy way of eating eggs. 1. For preparing poached egg, first boil water in a pan. 2. Add salt in a water. When water starts to boil, simmer the flame. 3. Pour the egg carefully in water. 4. Just stir the water without touching eggs. It's cooked until the egg white has solidified and but the egg yolk remains soft, just remove it into a plate. Slightly cut from top with very soft hand. 5. 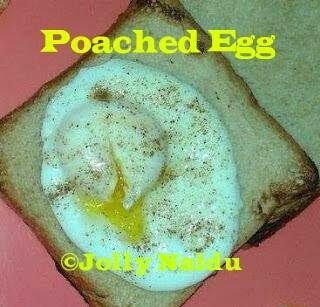 Poached egg is ready. Serve with buttered brown bread toast and just sprinkle the pepper / oregano on top. Serve immediately.